Bob Moskowitz is the chairman of the art department at Ventura College. In his teaching and in his own work, he stresses the importance of mastering the fundamentals, of not taking short-cuts. His colleagues describe him as a superb portraitist and fine colorist. Moskowitz’ works bring us fully-realized figures caught in the act of being human that draw the viewer into the subject’s world and wants to know more. We want to have a conversation with the young man who sits in a beach chair, drinking a can of beer, a Dominican’s cassock standing, paper-doll-like, in front of him. Is he questioning his past or contemplating his future? 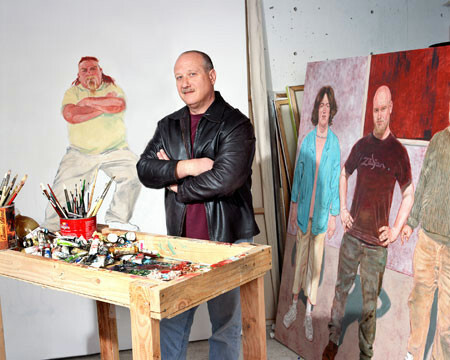 Although considered primarily a figurative painter, Moskowitz collaborates with his wife Marjorie, a landscape painter, to produce tableaus often depicting a surreal and playful narrative. Outgrowths of his teaching career are the European tours he and his wife Marjorie lead with his students. Bob Moskowitz’s documentation took place in 2004 and was sponsored by Peter and Lainie Cannon.